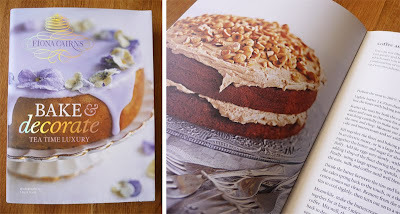 Bake and Decorate promises a lot with its pretty foiled and pastel cover. This is a good looking book. But like any cake, it had to fulfill it purpose beyond the glossy good looks. I like the idea behind this book. Half is dedicated to cake recipes (large, small cakes and biscuits) and the other half to decorating. Each cake has a suggested decoration but you are free to mix and match to some extent. Apart from one or two exceptions, at first glance, none of the methods of decorations really wowed me or were particularly adventurous. There are good instructions for making sugar roses (something I really want to learn how to do) but nothing to put hairs on your chest. 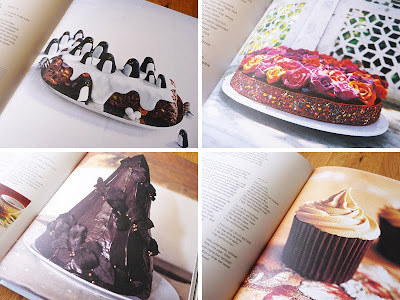 In the end I chose two cakes to make from this book, both for birthday celebrations so I did go out on a whim by baking recipes I hadn't tested before but an author that produces 220,000 cakes a year instills some sort of confidence in you. But the first, a Sticky Ginger cake (above) for Mr. Graphic Foodie's birthday was a bit of a disaster. When served up to a large group of rather er, "honest" friends, it generally had a big thumbs down. 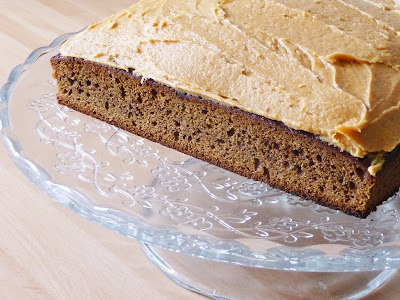 They were right, the treacle content was incredibly over powering and the timings gave a too dry cake, even after leaving it a couple of days to go sticky as suggested. It was saved from the bin to some extent by the salted caramel buttercream, however the instruction to let the caramel go "stone cold" before beating with the butter and icing sugar is just lunacy as it sets hard and is impossible to combine. I saved this by heating it again slightly and I was really happy with the eventual result. For another friend's birthday tea party, I chose the Chocolate and Beetroot cake. This was slightly more successful and I overheared one person give it a nice compliment. But again some areas of instruction did not give the desired result. Straining the beetroot pulp gave me hardly any juice to make the pink icing with, but hey ho, the cake did taste ok, moist and rich. I went for the Jackson Pollock inspired decoration as suggested which was fun to do. 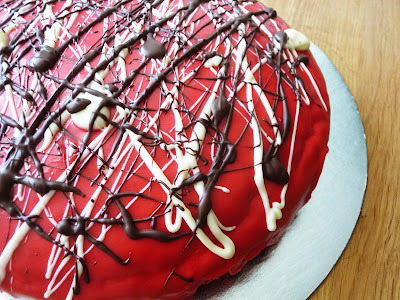 Without any beetroot juice for the icing, I made mine more vibrant and bolder with thicker chocolate splashes which I preferred to the Pepto Bismol example in the book. 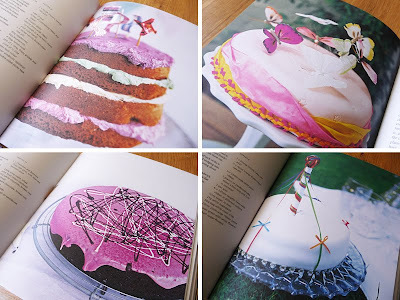 Quite a lot of the cakes in the book seemed to be aimed at young girls, lots of Barbie pink, bows and butterflies. I don't know why, but ribbon or any other unedible fabric decorations on cakes makes me feel a bit sick. No really they do. Pile up the edible glitter, sugared mice, petals, whatever, but things you can't eat don't belong on a cake in my book. But there were a few cake designs that really stood out for me. The chocolate cone cake is beautiful and would be a real challenge to bake. A Bollywood inspired wedding cake with handmade sugar roses is breathtaking. I also really liked the little penguins and the crystalised, edible flower project. Baking is a science and many factors can work against you. Ovens vary, the temperature of your ingredients is crucial and under or overworking a mixture can result in disaster. It must be very difficult to create a baking cookbook that is successful for everyone. I did check on Twitter and @gourmetraveller had baked the Victoria Sponge from the book rating it simply as a "dud" and the book as "all a bit "mum bakes for kids parties"", which aside from the few that appealed to me, I'd have to agree with. The author, Fiona Cairns' CV reads like a dream and counts Waitrose, Conran Shop, Liberty, the Ritz hotel, Harrods, Selfridges, and Fortnum and Mason as her clients as well as cake maker to the stars. So this lady really does know her cake. But apart from the beautiful design, I can't say I was overly enamored with this book after using it. I may try the mint and chocolate cupcakes and use the caramel butter cream again, but I will be sticking with my own baking recipes for now. Bake and Decorate by Fiona Cairns is published by Quadrille Publishing and costs £19.99.